Curlane Jones-Brown, M.D.’s “Dr. Curly’s S.E.N.S.E.S. 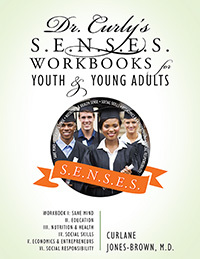 Workbooks for Youth & Young Adults” contains important concepts and skills for youth and young adults to overcome adversity, turn your life around and prevent you from becoming yet another sad statistic. Dr. Curly identified six principles that she unwittingly used to survive an early life of poverty and powerlessness.